Everyone’s story of poverty is different. In order to understand how complex the issue of poverty is in Canada, we created the Spotlight on Poverty blog series where we ask our board members, who all have a lived experience of poverty, about their story and how they poverty has affected their own lives. Last month, we asked the Chair of our Board of Directors, Harriett McLachlan, to shed some light on what it’s really like to experience poverty in Canada. This month, we explored these questions further in our second blog in the series, where we spoke to Wayne MacNaughton, our Treasurer and board member from Halifax, about his own experience of poverty. Q. In five words how would you describe your experience of poverty? I don’t know whether I can describe my experience in five words, it would probably take a bit more. I would describe it as being incapable of participating in the normal day to day life of my community. Q. Can you tell us a bit about your story of poverty? I lived in poverty as a child but was not aware of it at the time. I think that’s true for a lot of people who experience poverty in their childhood. My story is a little different than some of CWP’s board members who experienced poverty early in life but were able to move out of it thanks to education. I started work right out of high school and had a relatively middle class lifestyle for the first twenty-five years of my adult life. Later, I developed vision loss. Due to this disability I found myself living in poverty. I bounced around a bit during this time and ended up homeless. For me this is the nitty-gritty of what poverty is. It means survival and working through questions like: what am I going to do for a meal? I’ve now achieved stable housing for the last dozen years, but I’m still reliant on the system. I’m still living in poverty. Q. What do you feel you’ve lost and gained through your experience of poverty? When living in poverty, you lose opportunities for sure. It’s amazing to me when people say that Canada is a land of opportunities, but the reality is that you need a way to access those opportunities. What I’ve gained is a much better and deeper understanding of the kinds of challenges other people face, and a bigger capacity to empathize with other people. One example was when I was doing a media interview and the interviewer asked me about people who were getting laid off due to a mill shutdown somewhere. Some people were gloating that those people would now see what the real world is like. I explained to the interviewer that no, the people who lost their jobs are experiencing a genuine loss, they are going to end up living in poverty or being uprooted from their homes and there is no winner in that situation. It’s through my experience of poverty that I’ve gained that kind of empathy for other people. Q. What’s the most important thing you’ve learned about yourself because of living in poverty? The thing you find out about yourself by living in poverty really is a bit of a cliché, but it’s true. We are all resilient. Through poverty you discover your own capacity to manage very difficult situations. It’s even more than resilience, it’s discovering how you can be resourceful and cope with the challenges that you face. Q. Can you tell us about a time that you have felt stigma because of living in poverty? When you live in poverty and experience homelessness, people make assumptions about you. Sometimes when I’m sitting on committees they’ll see me only as “the homeless guy”, what could I possibly contribute other than telling my story? There is an element of people saying to me “go get a job”. This kind of stigma happens at different times. For example, I was once interviewed in the Chronicle Herald, and I read the blog comments where one guy commented “it doesn’t mention anything about him working”, that’s the kind of thing I run into a lot. Q. What do you think people in Canada, both living in poverty and not, can do to address discrimination toward people living in poverty? People can become better informed. They can do that by actually listening and observing when they have an opportunity to get that knowledge. It often comes down the way we hold meetings and consultations. If you’re holding a meeting about poverty measures or just poverty generally – look around the table. If there’s no one at the table living in poverty’ then you need to stop that meeting right there and find someone who lives in poverty to participate in the meeting. When governments are planning new programs or approaches to poverty and income support, at the very least it’s important to have people in poverty come and give their ideas. The government may be surprised at what they would hear and the programs they are considering may end up being more effective. The phrase I like to use when talking about this is “nothing about us without us”. I think this can be used on a lot of fronts and applied to any interest group, but is especially relevant when talking about poverty in Canada. Q. During the days where you most felt the effects of poverty, what kept you moving forward and advocating for the rights of people living in poverty? I think part of what kept me moving forward was stubbornness, and the resilience to just keep working away at how to address poverty. It’s easy to get discouraged in this fight, what’s kept me moving forward is the idea that even when it seems you’re not making progress, if you stop, things will start to go backwards. It’s important to keep up the pressure to end poverty, because the brutal reality is that there are people on the other side of the equation, people who don’t want the same things we do, and they will never give up, so we can’t either. I do think, even in my darkest moments, that I do make at least a small difference with a few people. I’ve been blessed with a good ability to communicate things, I’m descended from a middle class conservative family, so I think I can better understand where people are coming from. At the same time I can also understand what it’s really like to be homeless, because if you’ve never had to sleep on a park bench, you can’t possibly understand what that experience is like. Q. Is there anything else you want to add? Well, there’s the idea that it’s important for people in poverty to take their experiences and turn them into advocacy. People say that when you lose your vision, your other senses get better, but truthfully it’s just that you learn to use your other senses more. The same thing applies to people who experience poverty. When you don’t have money, you become more resourceful. Wayne MacNaughton (Halifax, NS) has had personal experience trying to make ends meet on social assistance. A firm believer in the motto of the disability rights movement – “nothing about us without us” – Wayne recognizes that solutions to poverty require engagement of the low income population. He has shared his message over the past few years as a Volunteer Inspirational Speaker with the United Way of Halifax Regional Municipality. Wayne is a bilingual community activist. 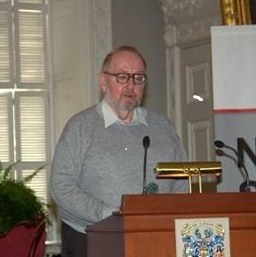 He is a member of the Community Advocates Network in Nova Scotia, a founding member of the Community Society to End Poverty in Nova Scotia, and has been involved with the human rights network ATD Fourth World.